School is out for most of the Inhabitotters around here, so finding ways to fuel our kids through their day at the park and on playdates has been on our minds. 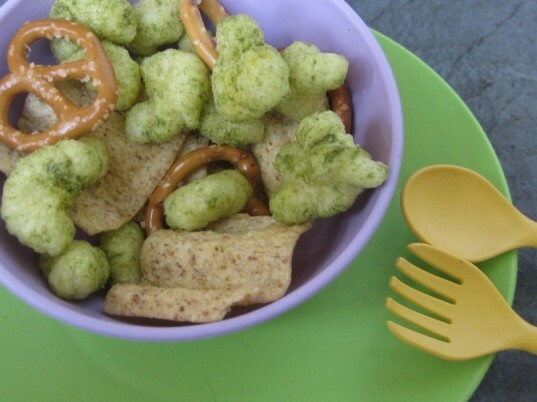 Here are six homemade snacks (and a few more store-bought options) that are guaranteed to give your kids the energy they need without making a big fuss in the kitchen. This combo of celery, peanut butter, and raisins brings back happy childhood snack memories and were staples on picnics and poolside. Of course, now there’s a much more impressive array of nut and seed butters on the market to choose from: sunflower seed, almond, cashew, and macadamia, beyond the traditional peanut butter. Any variety you choose will help make ants on a log into a filling, protein-rich snack. For another option, replace the raisins with dried cranberries or make frogs on a log with some sliced strawberries. Camp counselors and parents agree: trail mix is THE snack of choice to keep kids going, whether it’s during a midsummer’s hike, a marathon play session at the park, or during some unexpected traffic while driving around town. 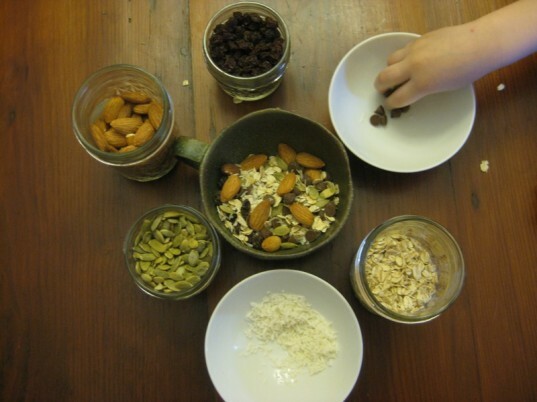 The best part of trail mix (other than eating it, of course!) is that making it can be a fun activity for everyone. Create a big batch and let everyone throw in their favorite ingredients, or have each child pick his own selection and put it in a reusable snack container. Try chopped nuts, pumpkin seeds, granola, raisins, baked banana chips, carob chips, organic cereal, pretzel bits, and coconut flakes. Tasting each other’s creations is encouraged! For another portable treehugger treat, make some homemade granola bars. Much, much tastier than those old-school infomercial chia pets looked. Chia seeds are delicious, comforting, and packed with protein and fiber. The finished product also looks like some kind of intergalactic goo, which is a plus for most kids. 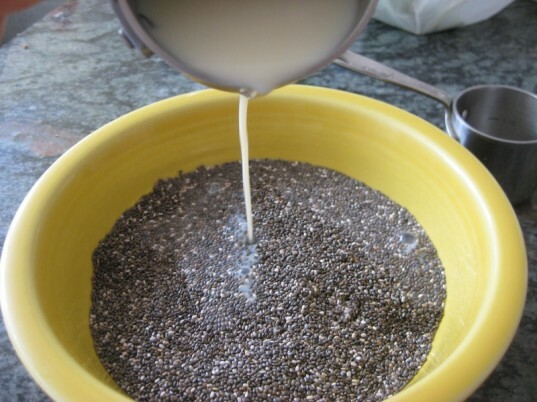 According to Living Raw Food, the latest cookbook from the raw restaurant Pure Food and Wine, you can simply use a 3:1 milk-of-your-choice to chia ratio; about 1/4 cup of chia per child is a healthy-sized portion. Swirl in some agave or maple syrup to taste and a few dashes of sweet spices like cinnamon and ginger. Then let the mixture chill in the fridge (or in front of the expectant eyes of some curious little observers). Note: This snack requires a bit of time prep as the chia takes about 30 minutes to absorb the liquid. It also tastes better cold, so this isn’t one we’d recommend carrying along with you on a day out unless you’re bringing a cooler. It can, however, be prepared the night or even a few days before, then kept covered, for an easy treat that kids can pull out of the fridge and eat when needing some extra energy. We also love it for breakfast. 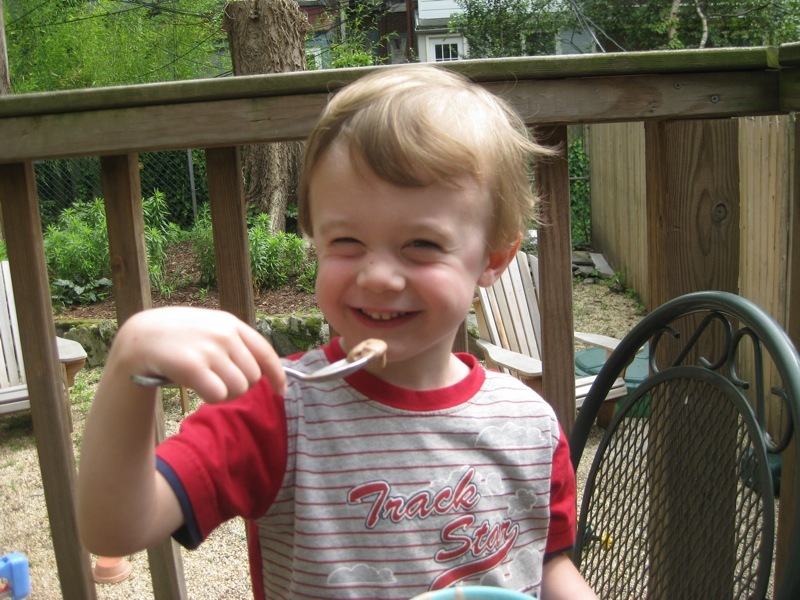 Sometimes kids need a snack…and they need it fast! Graham crackers smeared with a favorite farmer’s market jam and cream cheese or peanut butter will help prevent tantrums or whining caused unexpected sugar lows. Or spread graham crackers with some organic marshmallow creme or pop on a vegan marshmallow, sprinkle with carob chips, and call it a modified s’more. These treats are more portable than PB and J and are perfect little pick-me-ups. For parents trying to keep sweets to a minimum, replace the graham crackers with some organic whole wheat crackers. We often find ourselves out and about all day in the summer whether heading to the pool, farmer’s markets, and library all in one swoop, so sometimes a heartier snack is called for midday. 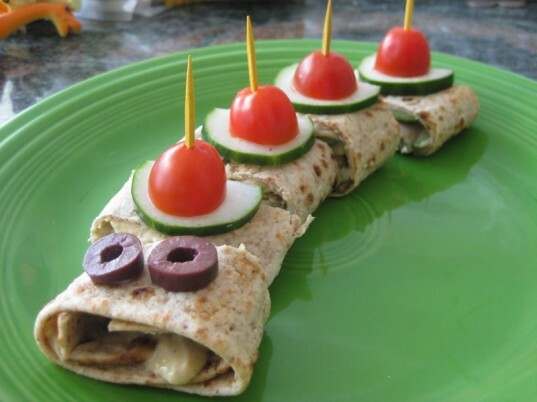 Make a savory roll-up by filling a flatbread or tortilla with hummus, cucumbers, olives, spinach, and tomatoes. Roll-ups will keep for a few hours and are less likely to get soggy or smooshed than sandwiches. Cut up, they also make appealing finger food for little hands. Other fillings can include tofu or chicken salad or thinly cucumbers and cream cheese. If you’ve got adventurous eaters on hand and a spot on the grass for some food prep, try a nori wrap, lettuce cups, or a collard greens wrap. Sometimes the best snacks, especially on those steaming summer days, is one you can actually drink rather than eat. 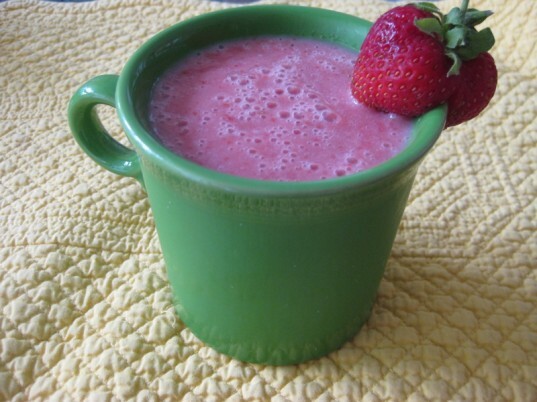 Smoothies and fresh-squeezed juices are a great choice because they help make up for all that liquid lost by kids while jumping, running, and learning how to swim. For a basic smoothie, combine 1 cup frozen chopped bananas, 1 cup frozen berries, and 1 cup soy milk in a high-speed blender, such as a Vitamix, adding agave nectar as needed for sweetness. For an especially thick and decadent treat, combine 2 cups frozen bananas, 1 cup soy or rice milk, 1/4 cup nut butter of your choice, 1 tablespoon of cocoa powder or carob powder and 1 tablespoon maple syrup or agave syrup. Both recipes make two 8oz servings. If you want to sneak some extra veggies in, try these smoothies. For fresh juices, find the best deals on whatever is in season at the farmer’s market, and let the kids help you make innovative new flavor combos. Having a juicer is wonderful on extra intense summer days, but it’s not required for all treats. Make the most of watermelons by blending up several cups of watermelon chunks (no rinds, please!) in a blender or food processor and then pushing it through a sieve. Delicious and refreshing! Of course, it’s always a good idea to have some healthy, premade snacks on hand. Clif Kid Zbar and Zbar Crispy are great backpack additions for day campers. While there are numerous tasty brands of organic whole wheat pretzels on the market, Newman’s Own Organics spelt pretzels and protein pretzels are especially delicious, crunchy, and add a dash of extra nutrients as well. For gluten-free kids, grab a Pure Organic Bar-they are also mostly raw, comprised of ingredients such as organic dates and organic brown rice protein, and come in flavors like cashew cherry and chocolate brownie. Clif Kid Zfruit ropes are fruit purees twisted into a rope shape and great for an on-the-go snack. Pirate’s Veggie Booty is also gluten-free and although not organic, it will add a sprinkling of greens to your child’s diet. 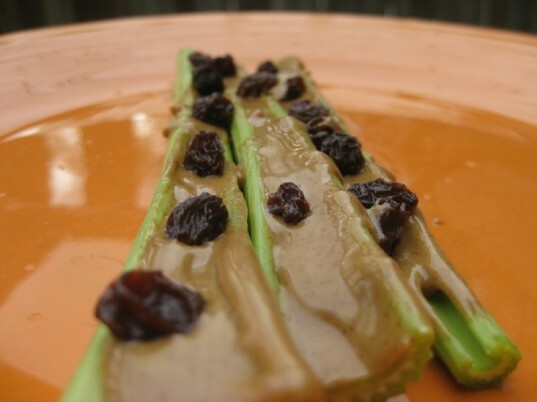 Ants on a Log This combo of celery, peanut butter, and raisins brings back happy childhood snack memories and were staples on picnics and poolside. Of course, now there’s a much more impressive array of nut and seed butters on the market to choose from: sunflower seed, almond, cashew, and macadamia, beyond the traditional peanut butter. Any variety you choose will help make ants on a log into a filling, protein-rich snack. For another option, replace the raisins with dried cranberries or make frogs on a log with some sliced strawberries. Trail Mix Camp counselors and parents agree: trail mix is THE snack of choice to keep kids going, whether it’s during a midsummer’s hike, a marathon play session at the park, or during some unexpected traffic while driving around town. The best part of trail mix (other than eating it, of course!) is that making it can be a fun activity for everyone. Create a big batch and let everyone throw in their favorite ingredients, or have each child pick his own selection and put it in a reusable snack container. Try chopped nuts, pumpkin seeds, granola, raisins, baked banana chips, carob chips, organic cereal, pretzel bits, and coconut flakes. Tasting each other’s creations is encouraged! For another portable treehugger treat, make some homemade granola bars. Chia Much, much tastier than those old-school infomercial chia pets looked. Chia seeds are delicious, comforting, and packed with protein and fiber. The finished product also looks like some kind of intergalactic goo, which is a plus for most kids. According to Living Raw Food, the latest cookbook from the raw restaurant Pure Food and Wine, you can simply use a 3:1 milk-of-your-choice to chia ratio; about 1/4 cup of chia per child is a healthy-sized portion. Swirl in some agave or maple syrup to taste and a few dashes of sweet spices like cinnamon and ginger. Then let the mixture chill in the fridge (or in front of the expectant eyes of some curious little observers). Note: This snack requires a bit of time prep as the chia takes about 30 minutes to absorb the liquid. It also tastes better cold, so this isn’t one we’d recommend carrying along with you on a day out unless you're bringing a cooler. It can, however, be prepared the night or even a few days before, then kept covered, for an easy treat that kids can pull out of the fridge and eat when needing some extra energy. We also love it for breakfast. Graham N' Jams Sometimes kids need a snack…and they need it fast! Graham crackers smeared with a favorite farmer's market jam and cream cheese or peanut butter will help prevent tantrums or whining caused unexpected sugar lows. Or spread graham crackers with some organic marshmallow creme or pop on a vegan marshmallow, sprinkle with carob chips, and call it a modified s'more. These treats are more portable than PB and J and are perfect little pick-me-ups. 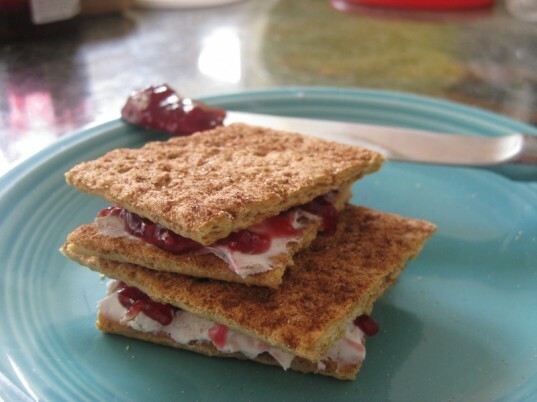 For parents trying to keep sweets to a minimum, replace the graham crackers with some organic whole wheat crackers. Roll-ups We often find ourselves out and about all day in the summer whether heading to the pool, farmer’s markets, and library all in one swoop, so sometimes a heartier snack is called for midday. Make a savory roll-up by filling a flatbread or tortilla with hummus, cucumbers, olives, spinach, and tomatoes. Roll-ups will keep for a few hours and are less likely to get soggy or smooshed than sandwiches. Cut up, they also make appealing finger food for little hands. Other fillings can include tofu or chicken salad or thinly cucumbers and cream cheese. If you’ve got adventurous eaters on hand and a spot on the grass for some food prep, try a nori wrap, lettuce cups, or a collard greens wrap. Juices and Smoothies Sometimes the best snacks, especially on those steaming summer days, is one you can actually drink rather than eat. Smoothies and fresh-squeezed juices are a great choice because they help make up for all that liquid lost by kids while jumping, running, and learning how to swim. For fresh juices, find the best deals on whatever is in season at the farmer's market, and let the kids help you make innovative new flavor combos. Having a juicer is wonderful on extra intense summer days, but it’s not required for all treats. Make the most of watermelons by blending up several cups of watermelon chunks (no rinds, please!) in a blender or food processor and then pushing it through a sieve. Delicious and refreshing! The Best of the Rest Of course, it’s always a good idea to have some healthy, premade snacks on hand. Clif Kid Zbar and Zbar Crispy are great backpack additions for day campers. While there are numerous tasty brands of organic whole wheat pretzels on the market, Newman’s Own Organics spelt pretzels and protein pretzels are especially delicious, crunchy, and add a dash of extra nutrients as well.